IN STORE PICKUP ONLY ON THIS ITEM! 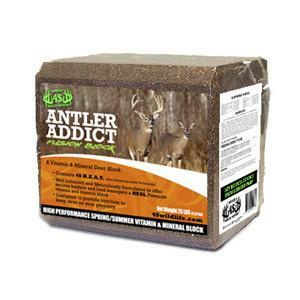 The Antler Addict Deer Mineral block is a superior quality, high powered mineral block. This well balanced block is packed with exceptional ingredients to help promote herd health and antler growth. This block is specifically designed to slowly disperse into the soil giving your deer all aspects of consumption choices. This high quality block will quickly raise the levels of vitamins and minerals in the body. Estimated consumption is 1 to 2 blocks per site per year depending on how dificient the deer on your property may be. Look forward to getting tons of spring and summer pics while also giving your deer these important nutrients to enhance overall growth.